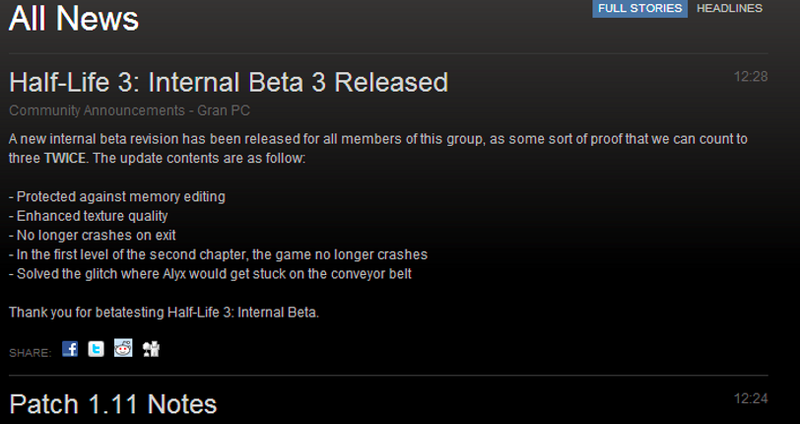 Earlier today, the Steam store featured a news item written by a developer claiming that the Half-Life 3 internal beta had been released. As you might've guessed, it was fake—but anyone looking at Steam could see the "news." The item is gone now, but people took screenshots, naturally. And here's the best/worst part: the trolling wasn't even intentional. Imagine what it must've been like for a fan to log onto Steam, hop onto their news tab, to see that finally—finally! There was some concrete Half Life 3 news! Heh, oh no. Oh, and...notice what the first letters in each of the updates spells out?